In many ways, Iceland have no right to feed at the top table of world football. A nation of just 325,000 people marooned on a volcanic island in the North Atlantic had barely left a mark on the sport. A nation miles away from the bright lights of the European Football, Champions League. Until a few years ago… One European Championship quarter-final appearance and a maiden World Cup qualification later, they are now no longer living off crumbs. The island nation now has tilled the volcanic soil and reaped the benefits of high coaching standards, volume training, and player preparation from the isolated ecosystem of thin, volcanic soils. Iceland has figured out how to meld the best of both the top-down and bottom-up approaches regarding player development. Icelandic football is enjoying an impressive and unprecedented gilded age and surge of footballing success to the point one wonders what is in the water of the islands’ famous geysers that yields such proficient players the likes of Eidur Gudjohnsen, son of Arnór Gudjohnsen, Gylfi Sigurdsson and Aron Einar Gunnarsson. Arnar Bill Gunnarsson, Director of Education for the Icelandic Football Association (KSÍ), believes the improvement is the result of consistency, education, and an iron-clad national mentality. They have a scouting system that works throughout the whole island. The island is not that small but it’s not that big. There’s no way, for example, when they choose their first group of players at the age of 14 that they miss out on any unknown but talented player. The team would go on to shock the rest of the footballing world by becoming the smallest populated country to ever qualify for a major tournament i.e. Euro 2016. That too by beating footballing giants Holland twice along the way without conceding a goal. 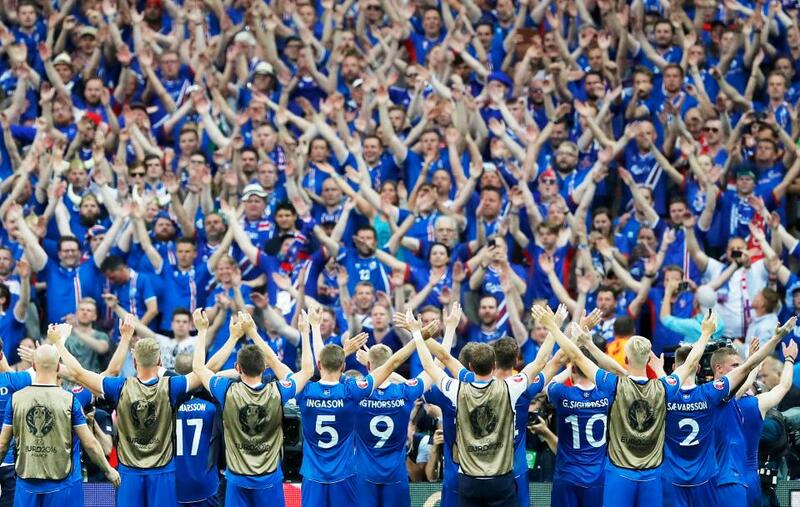 During the Euros, an eye-watering 10 percent of Iceland’s entire population travelled to France just to be there. Very few of them were able to get into all of the matches, yet they took the world by storm with their now-legendary thunderclap and Viking spirit. Progressing from a qualification group for World Cup 2018 where four of the six teams had been at Euro 2016 presented a significant task. The group was strong; Ukraine, Croatia, Turkey, all were in the Euros, then Finland and Kosovo are also very strong. Following a successful campaign of tremendous football during which Iceland conceded just one goal, it became a reality. This ability to learn from previous years has been a significant factor in Iceland’s incredible success. The disparity in wealth, even despite the added funding from last summer’s head-spinning tour of France that Arnar Bill mentions, is something that will never be closed in all reality. When the English FA spends in the region of £1bn on the new Wembley and the lavishly-designed St George’s Park, one realises there are different stratospheres within the footballing universe. At the same time, there is a wholesome satisfaction for the neutral to realise that money is not the single most decisive factor in building a stellar team.